Mark Stephen Schupp, 54, of Howard City, went to be with his Lord and Savior on Sunday, July 26, 2015 while on a hiking trip with the youth group. Mark was born February 11, 1961 in Chester, Pennsylvania, the son of John and Doris (Williams) Schupp III. He worked in maintenance at Rockford Public Schools since 1989. Surviving are his wife, Cynthia (Owen); children, Stephen, David, Luke, Isaac, and Jenna; brothers, Kevin and Joel; sister, Linda Thomas; mother-in-law, Joyce Owen; brothers-in-law, Howard and Mick; special uncle and aunt, Clarence (Nancy) Hamilton. He was preceded in death by his parents and father-in-law, Moses Ray Owen. At the age of 20, Mark gave his life to the Lord under the influence of his friend and mentor, Rich Steptoe. He accompanied Rich in his bus ministry, inner-city ministries, and visitation. Mark will be remembered for being kind and caring, intent on being a warrior for Christ. He lived to serve others with an intense passion and took special pleasure in serving his beloved wife, Cindy, and their five children. He made life fun, coaching their basketball teams, taking them on trips, and creating adventures around their home. Life with Mark was never dull, as his creativity filled their lives with pirates, caped heroes, Indians, cavemen, knights, dinosaurs, fireworks, bonfires, zip lines, forts, tea parties, science lessons, woodworking, wrestling/boxing, and so much more. Every birthday was marked with a special Mark-created cake. 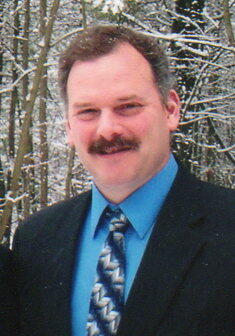 Mark proudly invested in his children’s interests by attending sporting events, plays/musicals, and recitals. After all the fun, he was a dad willing to listen, read, talk, and fill his children’s lives with the Word of God. Mark was a member of the First Baptist Church of Newaygo where he taught an adult Sunday school class and was an AWANA leader. In the past, Mark served as a VBS coordinator, visitation team member, youth leader, and basketball ministry helper. His dedication to God was evident in how he served his church and community. When Mark met Cindy, he was a city boy. He let himself be led to the woods of Michigan and never looked back. He assimilated himself into her world, and together they created a life for their family. He worked alongside Cindy to help care for their family members, their children, and their church family. It’s this Mark that will be greatly missed, but we celebrate that he is now enjoying being in the presence of his Lord. The family will greet friends Thursday from 5-8 pm at the Bliss-Witters & Pike Funeral Home, in Cedar Springs. The celebration of life will be held Friday at 11:00 am at First Baptist Church, 233 S. Main St., Cedar Springs. Pastors Daryl Crawford, Danny Hicks, Mark Holman, Mike King, and Steve Mackey officiating. Interment at Algoma Township Cemetery. Memorial contributions may be made to Pine Ridge Bible Camp Sports Discipleship Ministry or to an education fund for Mark’s children.